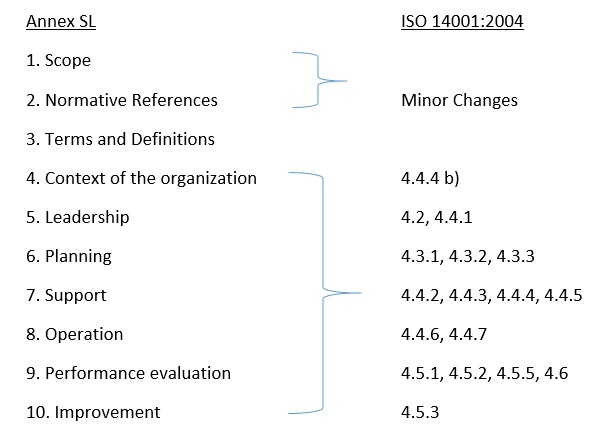 Proposed Changes to ISO 14001:2004 - Tavares Group Consulting Inc. Organizations who certify to management systems will be seeing some big proposed changes over the coming 24 months. Three popular standards, ISO 14001:2004 Environmental Management System, ISO 9001:2008, and OHSAS 18001 (which is transitioning to ISO 45001 Occupational Health & Safety Management System) are currently being revised and expected to be released in mid and late 2015, and late 2016 respectively. The proposed standard focuses a great deal on ensuring the EMS is fully integrated throughout business processes in order to increase your knowledge of external and internal issues, the needs and expectations of stakeholders, and risks from threats and opportunities. While certain elements from ISO 14001:2004 have been maintained in the proposed standard (e.g. internal audit, management review, evaluation of compliance, identification of significant aspects, monitoring and measurement etc. ), there are numerous proposed changes to ISO 14001 that would need to be supplemented to current EMSs. Below, the significant changes have been summarized into 10 categories. 2. Context, Interested Parties, and Environmental Condition – A new requirement has been proposed for the organization to identify their context as it relates to the environment. Focus has also been placed to identify issues and circumstances related to the needs of interested parties (i.e. stakeholders) and the identification of the local, regional or global environmental conditions (i.e internal and external issues) that affect the organization and vice-versa (i.e. the environmental condition). 3. Leadership and strategic management – a new clause has been proposed which would require those in leadership roles to have the assigned responsibility of promoting environmental management within the organization. The proposed standard also identifies the need to integrate the EMS within the overall business strategy and business processes. 4. 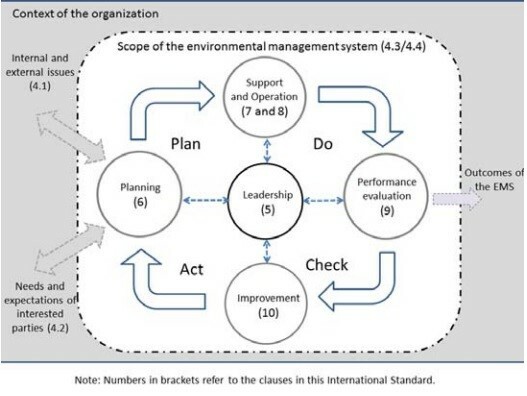 Continual improvement: management system vs. environmental performance – organizations would be expected to commit to proactive initiatives (within the context of their organization) to improve the environmental performance of their organization rather than the improvement of the management system itself. The proposed framework also places a greater emphasis on the improvement of the organization’s environmental performance as it relates to the context and environmental policy commitments, also requiring the demonstration of achieving objectives and the evaluation of performance. 5. Life cycle perspective – the requirements of organizations to manage aspects associated with outsourced processes (i.e. procured goods and services like calibration) is proposed to also control and include the impact associated with a product’s use and eventual disposal. While this will not require organizations to perform a life cycle assessment, this does tie into integrating the EMS within the product/service design, development and change processes from a strategic management perspective. A life cycle perspective should be used when considering environmental aspects. 6. Indicators – a proposed term identified within the standard, indicators will be used to demonstrate the successful integration of objectives and evaluate performance. 7. “Compliance Obligation” – proposed term replacing ‘legal and other requirements’. 8. Organizational risks from threats and opportunities – organizations would be required to identify and address potential risks from threats and opportunities when it comes to setting objectives, which would be monitored and measured, taken into account during the internal audit, and would be discussed during management review. Opportunities would also be included as an input during the process of design, development and change of products and/or services. For example, if an organization were to determine that solid waste diversion was a significant aspect, some opportunities could be to move to single stream recycling or to use a product with less packaging/produces less waste. 9. Outsource – any processes which are outsourced (i.e. calibration, preventative maintenance) would be influenced by the EMS. 10. Documented information vs. Documents, documentation and records – The terms documents, documentation and records are proposed to be removed from the standard and replaced by documented information. It is estimated that organizations currently certified ISO 14001:2004 would have three years (2018) to transition to the revised version. The reasoning behind a longer transition is due to the significance of the changes throughout the standard. The main linkage between the revised versions of ISO 14001:2015 and 9001:2015 are that they will be structured according to Annex SL. ISO identifies that by doing so, management systems within organizations will be harmonised. Is your organization prepared for these changes? Whether your business is ready to implement a management system for the first time, optimize the established system to meet the requirements of a new version or prepare for integration with other systems, Tavares Group Consulting can help with those needs. Visit our Management Systems Case Studies page to learn more, and contact us to see how we can help you through this transition.